Despite not really knowing anything about it, I've recently become a little bit obsessed with architecture. All that wistful thinking about building our own house and hours wiled away watching Grand Designs have resulted in a bulging Pinterest board and an impressive collection of coffee table books. I basically spend too much time staring at pictures of houses that I wish I lived in - and not by coincidence, most of them seem to be located in Scandinavia. Yes, my love for the Nordic lands also extends to their architecture. One thing that I've noticed that all the structures that I'm admiring have in common (other than impeccable design, obviously) is that they blur the boundaries of the outdoors and the indoors. The typical British house (like the terrace I'm currently writing this in) have a very distinctive line between indoors/outdoors. Windows are small, our curtains are always drawn and when we're sat inside, the outdoor world becomes a mere memory. All this changes in Nordic design; the outdoor landscapes are celebrated through the design of the house and elements of outside are effortlessly brought directly indoors. If you're building your home in such beautiful surroundings, why hide the landscapes from view? Obviously, I know this concept isn't solely used in homes built in Denmark, Sweden, Norway, Finland and Iceland. There are so many incredible Modernist builds in America in particular, as well as dotted around many other locations around the globe. One of the highlights of our drive around Skye several years back was ogling all of the amazing Pre-Fab houses. But it is Nordic design that has particularly caught my eye, as there is such a connection with nature. Everything about Scandinavian design seeks to find the perfect balance between style and function, and this is apparent across their architecture. Functionality and comfort are key, and the layout of homes is carefully considered from a usability point of view. Rooms are multi-functional and you'll almost always find a wood burning stove to heat the building on sub-zero winter days. Large windows allow natural light to flood into the rooms, making the most out of the little light available during the winter and celebrating the long days of summer. Everything is simplistic, offering no more that what is needed with clean lines making small spaces appear larger. Even in the city, nature isn't far away, and there are constant reminders through the design of the spaces themselves as well as the connection to the outdoors. Large windows frame the surrounding landscapes like living pictures, constantly updating the views as the seasons change. Wood is using wherever possible; as the frame of homes, as a feature indoors and clad on the outside. It's common for interior walls to boast a natural or painted wood finish, bringing the forest indoors. There are plenty of cosy cabins in the woods, but its the more minimalist and simplistic designs that I'm really attracted to, especially when the wood paneled walls are given a lick of white paint. Quite often, large patio doors serve both as a gigantic window (perhaps taking up an entire wall of a room) and as a gateway to the outdoor world. In summer, these glass doors are pulled open at every opportunity and dining furniture is dragged out onto the patio in a move that both expands the living space and completely removes the inside/outside boundary. With such dark and cold winters, every effort is taken during the summer months to spend time outdoors, and if your home can easily be opened up to the outside world, what better way to combine home comforts with fresh air? This connection to nature, even when indoors, aids the Scandinavian slow pace of life that I so admire. If you can simply pull back your window and eat your breakfast sat on the porch, why would you rush? You would want to wake early, wrap yourself in a blanket and linger over your meal while appreciating the morning air. No one would hurry to finish dinner if your dining table had a view of the stars. Even in the winter, huddled up indoors with the fire lit, the ghostly shadows of the trees are always in view (another Scandinavian design point: curtains are virtually non-existent). 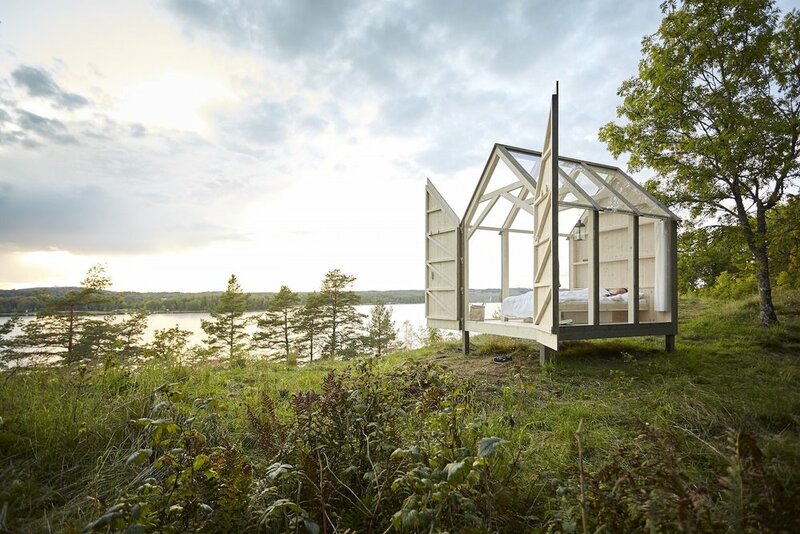 If you're searching for the ultimate example of blurring the boundary of the outdoors and indoors, look no further than Visit Sweden's 72 Hour Cabins. Designed by Jeanna Berge, the structures drew inspiration from traditional barns, simply replacing the wooden walls with glass to bring the wilderness as close as possible to the interior of the huts. The 72 Hour gimmick refers to case-studies that suggest that spending just 72 hours in Sweden can drastically reduce stress levels. Five individuals with highly stressful jobs all showed a decrease in blood pressure, stress levels and heart rate, as well as a boost in creativity after spending just 72 hours in the cabins. There's also a similar build made predominantly out of glass on a Finnish island, flanked by a wooden shed. A collaboration between Finnish designer Linda Bergroth and Helsinki-based Avanto Architects, this dramatic structure sits on a private island and contains just a bed, a record player and plenty of plants (it is technically a livable greenhouse). The only problem with the uninterrupted view of the lake and forest is that you may not wish to get out of bed and explore. These entirely glass structures aren't for the faint of heart, and definitely aren't suitable for anyone who values their privacy (although, you're in the wilderness and there isn't likely to be anyone else around). But they clearly demonstrate how important it is for buildings to have a connection to nature, especially if they are located in such stunning landscapes. Why would you want to hide away inside if you're surrounded by such natural beauty? Simply gazing out of the window would be far more interesting than any nature documentary.